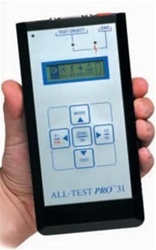 All-Test PRO 31: Motor, Coil and Winding Analyzer Reliability Direct, Inc. Your Direct Source for Reliability, Maintenance, Test & Measurement! Trouble Shooting - Know in a few minutes what the problem is: electrical or mechanical, coil or rotor, internal fault or ground fault. Start-up - Make sure all electrical motors are working in top condition. Light PdM - Also suited for limited, manual, Predictive Maintenance. The hand-held ALL-TEST PRO® 31 incorporates tests for faults to ground, internal faults such as turn-to-turn and coil-to-coil and phase balance. Electric interference from residual or stray currents from test-object or surrounding power sources is measured by an included EMI test. Testing frequencies are selected from a range of 25 - 800 HZ, which enables the instrument to test fractional as well as large AC/DC motors, generators and transformers, multi or single phase. In addition, the instrument features a revolutionary, patented rotor test, which quickly finds broken rotor bars and casting voids. The instrument is hand-held and weighs only 1 lb. It provides safe, off-line testing on de-energized machinery and will save the user downtime, unnecessary repairs and on utility bills. It will take the guess-work out of motor trouble shooting and management.